The mission of the Sports Diversity Leadership Council (SDLC) is to train tomorrow’s leaders today but that doesn’t mean that all this learning has to be solemn and boring. Held in August at the Connect Sports Marketplace in Salt Lake City, The Goldfish Bowl is a great example that learning and fun can go hand-in-hand (or fin-in-fin?). 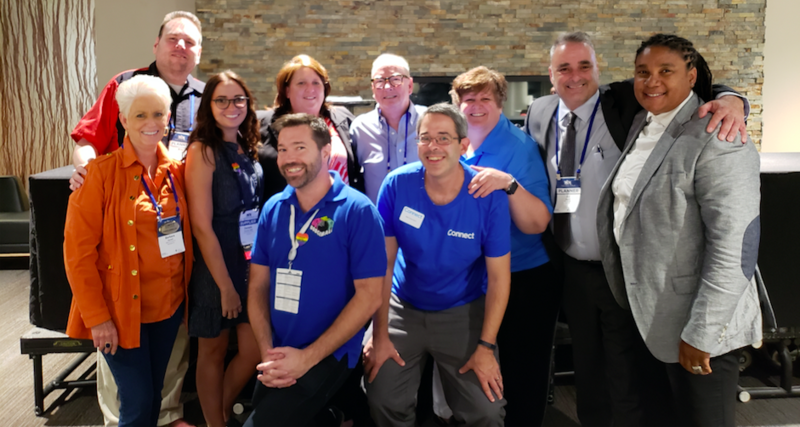 A fun take on the TV show “Shark Tank,” The Goldfish Bowl was sponsored by Compete Magazine, Connect Sports, Diversitas Media and several other media partners with over $18,000 in cash and prizes going to the winners, with special thanks to Connect Sports Marketplace. But it was also a great SDLC learning exercise on how to put together and deliver your organization’s best presentation for potential partners and sponsors. The four finalists competing for money and prizes based on the strength of their presentations included: the Amateur Sports Alliance of North America (ASANA), represented by its commissioner, Angela Smith, SDL; the Gay Polo League (GPL) represented by Chip McKenney, president; WeHo/USA Dodgeball by its president Jake Mason,SDL; and the Lynn Lewis Foundation represented by its founder, Mashonda Gilmore. Judges for the presentations were Danielle Vincenti, SDL from Richmond Region Tourism; Catherine (CJ) Kelly, SDL from the North American Gay Amateur Athletic Alliance (NAGAAA); and D.J. Doran, SDLT from Diversitas Media. Based on the compelling presentations, the judges declared a tie for first place and divided the first and second place prize packages equally between ASANA and the GPL. They also declared a tie for third place between WeHo/USA Dodgeball and Lynn Lewis Foundation, dividing the third and fourth place prize packages equally between them. Here is how one of the contestants described her experience in The Goldfish Bowl. MY DAY AS A GOLDFISH! I got to “Jump Into the Goldfish Bowl” to showcase ASANA, the organization I love. Not only did ASANA compete but we tied for first place. For those who don’t know, ASANA became a charter member of the Sports Diversity Leadership Council (SDLC) in 2018. ASANA represents a sports community of female athletes rich with pride, unity and love for who we are. For just those reasons we were chosen as one of four SDLC finalists for the Goldfish Bowl competition. So with sweaty hands and my Southern drawl it was time to showcase ASANA with a concise PowerPoint presentation I created. With an unexpected lump in my throat I began explaining what ASANA was, who and what we represented and the family we’ve become. As I went on to highlight our Peanut Foundation, the many charity organizations we’ve supported over the years and the softball play of the ASANA World Series I found myself tearing up, realizing that not only was I representing the organization but also all the players past, present and future who carry on our great tradition. SDLC’s next Goldfish Bowl will be held at the SDLC Conference in Scottsdale, Arizona on Saturday, November 10, 2018 as part of the Compete Sports Diversity Awards weekend (aka, The Petey’s). The water has been tested and proven to be “shark-free” so join in the fun and experience the added bonus of learning how to create an effective Sponsorship Presentation. Contact us at [email protected] and we will provide you further information.